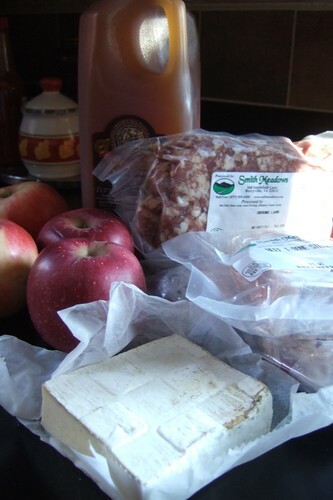 Photo: Today’s farmers’ market basket—apples, apple cider, 2 & 1/2 years cave-aged raw milk cheddar cheese, and lamb and steak from Smith Meadows Meats. For Del Ray Farmers’ Market shoppers: don’t trust on-line schedules that report that the Del Ray market ends the first Saturday in December. The salty dude who sold me the aged cheddar above told me that the Del Ray market will continue on. A small but hardy group, including the cheese and yogurt seller, Smith Meadows Meats, and a few others, will try to keep selling all winter on Saturdays, the regular market day.